Srila Jaganath Das Babaji Maharaj, también conocido como Vaisnava sarvabhuma, fue quien confirmó el lugar de nacimiento de Sri Chaitanya Mahaprabhu cuando fue descubierto en Mayapur por Srila Bhaktivinoda Thakur. Cuando llegó al Yoga-pitha comenzó a saltar en el aire a pesar de su avanzada edad de más de 100 años. Aunque estaba ciego e inválido, empezó a cantar y bailar extáticamente, confirmando el lugar exacto de la aparición de Sri Gauranga. La imagen de Srila Jaganath Das Babaji Maharaj está en el panel del parampara que se encuentra en todos los altares de los templos de ISKCON. No todos los devotos saben que el Guru-parampara que está en esos altares es una línea de sucesión discipular siksa-parampara. Fíjense que después de Srila Bhaktivinoda Thakur no se encuentra su diksa-guru Vipina bihari, sino Srila Jaganatha Das Babaji Maharaj, quien es considerado como subhajana-guru en la línea bhagavata-siksa-parampara. 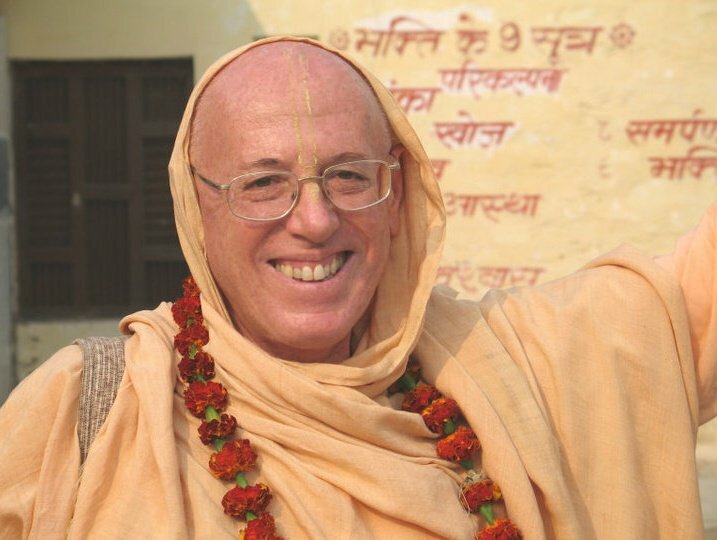 Las imágenes de los Vaisnava-acharyas en la línea de ISKCON que se encuentran en los altares de los templos de la misión fundada por Srila Bhaktivedanta Swami Prabhupada, vistos de izquierda a derecha son las siguientes: Srila Bhaktivedanta Swami Prabhupada, Srila Bhaktisiddhanta Sarasvati Thakur Prabhupada, Srila Gaura-kisora das babaji Maharaj, Srila Jaganatha das babaji Maharaj, y en el extremo derecho una imagen de los seis Goswamis de Vrindavana; Sri Rupa, Sri Sanatana, Sri Jiva, Sri Gopal-bhatta, Sri Raghunatha dasa, y Sri Raghunata bhatta. Para conocimiento de los devotos, es preciso dar la línea de sucesión discipular entre Jaganatha das babaji Maharaj y los seis Goswamis. Srila Jaganatha das babaji fue discípulo de Madhusudhana das babaji, en la línea de Baladeva Vidyabhusana. Madhusudhana das babaji (cuyo samadhi está en Surya-kunda, en el perímetro de Govardhana) recibió babaji-vesa del famoso Siddha Krishna dasa babaji de Govardhana, y aprendió los secretos del bhajana-siksa de Sri Vaisnava-charana dasa babaji Mahasaya de Brahma-kunda (que fue discípulo de Radhamohana Thakura, el tataranieto de Srinivasa-acharya), en la línea de Srila Narottama das Thakur. El samadhi de Siddha Krishna dasa se encuentra en Manasi-ganga, en Govardhana. Sri Vaisnava-charana dasa babaji ---Siddha Krishna das baba----Sri Madhusudhana das babaji----Srila Jaganatha das babaji---Srila Bhaktivinoda Thakur. 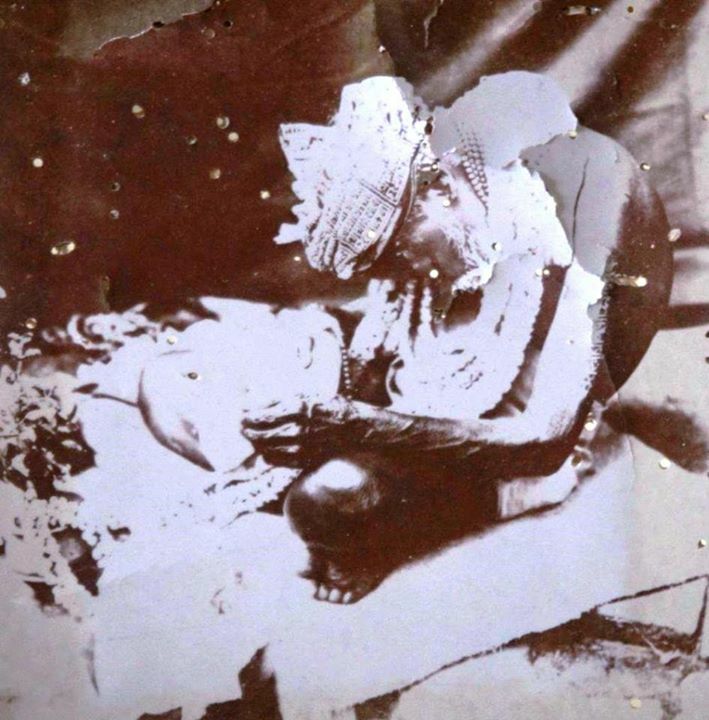 Cuando desapareció Srila Bhakti-prajñana Kesava Maharaj, el sannyasi-guru de Srila Bhaktivedanta Swami Maharaj, nuestro guru Maharaj quería poner su foto en la sucesión discipular, después de su propia foto y antes de la foto de Srila Bhaktisiddhanta Sarasvati Thakur. Aunque este fue el deseo de Srila Prabhupada, por inexorables designios del destino la foto que pidió nunca fue enviada y no fue puesta en los altares con el resto de la sucesión discipular. Pocos conocen este hecho, relatado en un testimonio biográfico de Srila Bhaktivedanta Narayana Maharaj acerca de su relación con nuestro Srila Prabhupada. Como es también propicio para el beneficio de los devotos presentes y futuros que conozcan acerca de la personalidad extraordinaria de Siddha dasa babaji de Govardhana, después de esta breve nota publicaré otra con un resumen biográfico sobre este gran Vaisnava, al que estamos conectado en la línea discipular de bhagavata-siksa-parampara. Los interesados pueden también consultar esta otra referencia: The Madness of the Saints: Ecstatic Religion in Bengal June McDaniel – The university of Chicago Press, 1989 - ?Religion. The word ‘gulala’ refers to the powdery ‘bright red pigment’ used in religious ceremonies all over India. Once, on the occasion of the annual Holi festival, after having thrown red colored gulala powder on each other, Radha and Krishna came to this kunda near Ganthuli village to bathe. After they had bathed and sported in the kunda for some time, the water of the kunda turned ‘gulali’ or a reddish color, due to the red gulala powder that had been thrown on the ‘divine lovers’ during the holi festivities. The name of this village has been derived from the word ‘gantha’ which means ‘knot’ and refers to this being the place where the ‘knot’ was tied. One day, Radha and Krishna accompanied by the gopis, came here to play holi, by throwing red colored powder (gulala) on each other. During the course of the festivities, Radha and Krishna sat down together on a nicely decorated throne prepared by the gopis. While Radha and Krishna were engaged in talking together, Lalita-sakhi, Radha’s close friend, sneaked up behind the throne and secretly tied the corner of Radha’s saree to Krishna’s dhoti. This tying together of a girl’s saree and a boy’s dhoti is always done at the time of a marriage ceremony, signifying the union of oneness between husband and wife. When the holi festivities came to an end and time came for Radha and Krishna to take their bath at Gulala-kunda, when they stood up, to their surprise they found that their clothes were tied together. At that moment, all the gopis suddenly started laughing and clapping their hands in great happiness at seeing the ‘Divine Couple’ tied together, as if they had just been married. 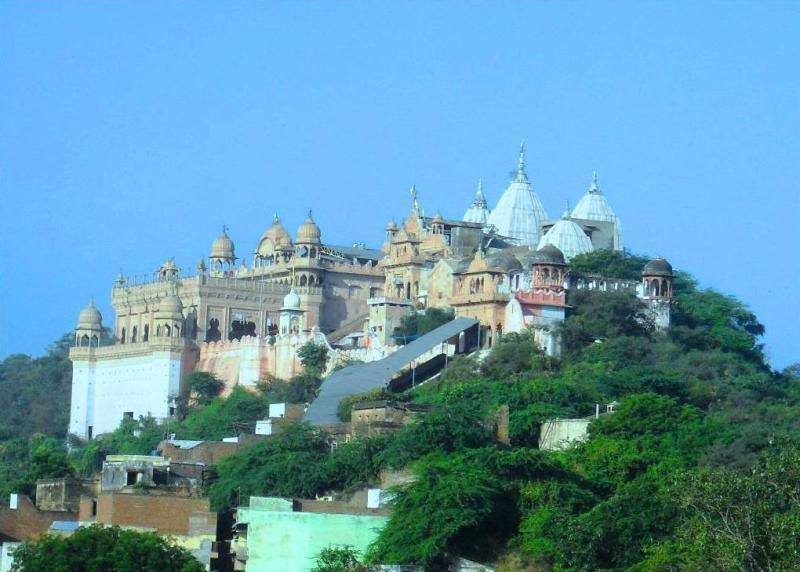 While on His parikrama around Vraja Mandala, Lord Chaitanya Mahaprabhu arrived at Govardhana Hill, but refused to climb the sacred hill to visit the Gopala Temple situated on top of the hill. This was because according to Lord Chaitanya’s spiritual vision, Govardhana Hill was non-different from Lord Krishna Himself, and therefore He refused to place His feet on the hill. Even though the Vedic scriptures confirm that Lord Chaitanya Mahaprabhu was an incarnation of Lord Krishna, He appeared in the form of an ordinary human being and behaved just like any other humble Vaishnava devotee of Lord Krishna. During His life-time, Lord Chaitanya strictly observed all the rules and regulations of sadhana-bhakti and set the highest standards of devotional service for all future generations of devotees to follow. Even to this day, the followers of Lord Chaitanya who are known as Gaudiya Vaishnavas do not step on Govardhana Hill remembering Lord Chaitanya’s own example. While performing parikrama of Govardhana Hill, Lord Chaitanya had darshana of Lord Harideva where He danced in ecstasy for hours. After leaving the temple of Harideva, He began to think about Lord Gopala, the deity found by Shrila Madhavendra Puri, the celebrated guru of His own guru Shrila Ishvara Puri. Lord Chaitanya began lamenting that because the temple of Lord Gopala was on top of Govardhana Hill, He would never be able to have darshana of the deity, because He had decided not to set His foot on the sacred hill. The next day, continuing with His parikrama, Lord Chaitanya arrived at Govinda-kunda where He took His bath. At that moment, news arrived that the deity of Lord Gopala had been moved to the village of Ganthuli Grama for safety, due to a rumor of an imminent attack by a rampaging horde of Mohammedan Turk soldiers out on a looting spree. Upon hearing this incredible news, Lord Chaitanya felt great ecstasy and immediately left for Ganthuli Grama to have darshana of Lord Gopala. After arriving at Ganthuli and seeing the extra-ordinary beauty of Lord Gopala, Lord Chaitanya entered into a state of transcendental bliss and while incessantly chanting the holy names of the Lord, He began dancing in great ecstasy. The deity of Lord Gopala remained at Ganthuli Grama for three days and Lord Chaitanya also remained there, totally immersed in the mood of ecstatic love. According to the Chaitanya-charitamrta, the threat of an attack by Turks was a transcendental trick performed by Lord Gopala, as a pretext for giving darshana to Lord Chaitanya at Ganthuli. It has also been said by others, that Lord Gopala actually desired to have darshana of Lord Chaitanya Mahaprabhu, the incarnation of divine love and the embodiment of ‘Radha-bhava’. This celebrated deity of Shrila Madhavendra Puri was very famous for His many extra-ordinary pastimes and there are innumerable stories where the deity interacted directly with His devotees. A few years after giving darshana to Lord Chaitanya, Lord Gopala made a similar arrangement when He gave darshana to Lord Chaitanya’s most senior disciples, Rupa and Sanatana Goswamis at Mathura, where the deity had been taken for safety on the pretext of another imminent attack. When all the deities of the Gaudiya Goswamis were moved to Rajasthan for safety during the despotic rule of the tyrant Aurangzeb, the deity of Lord Gopala was moved to Nathadwara under the patronage of the king of Udaipura. The deity is still residing there even today and is presently known as Lord Shri Nathaji. The tradition amongst Gaudiya Vaishnavas of not setting foot on Govardhana Hill has been adhered to by all Gaudiya acharyas including the Six Goswamis. It was only on the direct order of Lord Gopala that Shrila Madhavandra Puri stepped on the sacred hill, because Lord Gopala wanted to be installed on the top of Govardhana Hill and asked Madhavendra to install Him there and also build a temple. This means that the pujaris serving the deity had to climb Govardhana Hill every day to perform the seva-puja. Therefore, a large Govardhana-shila was installed at the base of the sacred hill at Yatipura known as the dandavata-shila, and the pujaris would circumambulate this shila seven times while paying dandavata-pranams, and this was equal to performing dandavata-parikrama around the entire Govardhana Hill, and by this they would free themselves from any aparadha. 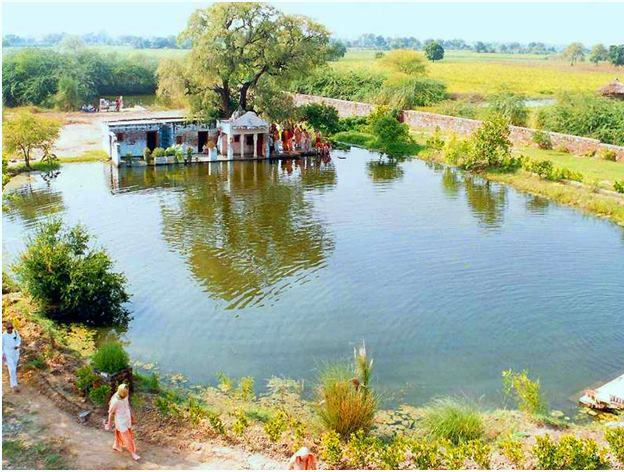 This famous kunda on the outskirts of Nandagrama is the residence of the gopi Vrinda Devi, who is very expert in arranging meetings between the ‘divine lovers’ Radha and Krishna. Every morning Purnamasi meets Vrinda Devi here at Vrinda-kunda and together they make plans for the days loving encounters between Radha and Krishna. After Purnamasi returns home, Vrinda Devi, within her mind, begins to meditate on decorating the various forests, groves, and bowers, where Radha and Krishna are going to meet, by arranging varieties of aromatic creepers and vines, beautiful flowering bushes, and blossom bearing trees of various hues around the chosen places. Vrinda Devi, the predominating deity of Vrindavana forest, is non-different from the forest itself including its fauna, and simply by her desire, she is able to manifest a perfect transcendental environment for Radha and Krishna to enjoy Their amorous pastimes. Therefore, the forests of Vrindavana always appear as if spring-time is manifesting there every single day. She is assisted by her friends of whom Vira Devi (Sanket Devi) is the most prominent, as well as her yellow colored pet parrot named Daksha, who acts as a messenger as well as bringer of news. Vrinda Devi’s position is unique because as the predominating deity of Vrindavana forest and an expansion of Yogamaya Devi, by her mercy one can enter into Krishna’s transcendental pastimes in Goloka. For this reason she has manifested herself as Tulasi Devi to accept the worship of aspiring devotees and thereby help nurture their creeper of devotion. Therefore, she is also called Bhakti Devi, the goddess who can bestow upon a devotee pure devotional service to Krishna. Vrinda Devi is so dear to Krishna that unless an offering of food has a tulasi leaf placed upon it; Krishna does not like to accept it. At the present time Vrinda-kunda as well as the small temple containing the deity of Vrinda Devi, are now being managed by Iskcon devotees. In the Bhakti-ratnakara it is said. “This is Gupta-kunda where Krishna and His friends headed by Subala secretly played various games during their wanderings through the forests.” The word ‘gupta’ means ‘secret’ or ‘hidden’ and this particular kunda holds many such ‘secrets’ as well as ‘hidden truths’. The caretaker of this kunda is Vira Devi (Sanket Devi), the confidential friend and companion of Vrinda Devi. After she has finished cooking in mother Yashoda’s kitchen, Radharani supposedly leaves for Her home in nearby Yavat village, but with the help of Her friend Danishitha, She stealthily makes Her way to Gupta-kunda for a secret rendezvous with Her beloved Krishna, who also sneaks away with some of His friends and also makes His way to Gupta-kunda to meet secretly with His beloved Radha. Gupta-kunda is very important because in the aprakata-lila, it is one of the three locations of the sacred Yoga-pithas of Vrindavana Dhama, where Radha and Krishna sit in audience surrounded by all Their eternal associates, who assemble there in their respective positions around the throne on which Radha and Krishna are sitting. It is rather like when a king and queen hold a royal durbar or state assembly, where all the officials connected to the royal entourage are present at the same time. This grand assembly of eternal associates takes place at the Yoga-pitha at Gupta-kunda in the early morning, then at midday at the Yoga-pitha at Radha-kunda, and then in the evening at the Govindaji yoga-pitha in Vrindavana. The word ‘yoga’ means to ‘link-up’ or ‘to meet’ and the word ‘pitha’ means a ‘sacred place’, a ‘transcendental place’, or a ‘secret meeting place’. All those personalities who take part in the divine assembly at the Yoga-pitha are all eternally liberated nitya-siddha devotees, who possess all the perfections of yoga and are eternally situated in pure unalloyed devotional service to Radha and Krishna, and have descended along with Krishna to take part in His earthly pastimes. In this particular forest grove also called Nikunjavana, Krishna massaged Radharani’s lotus feet and decorated them with red yavaka (vermilion). Krishna also massaged Her delicate limbs with perfumed oil, comb Her long black hair into braids, and applied cosmetics to Her moon-like face, and dressed Her with silken garments and gem-encrusted ornaments. After the rasa-dance was over the gopis would prepare a soft bed made of flower petals and invite Radha and Krishna to lie down together so They might spend the night entwined within each others arms. At Seva Kunja, one can see the actual place known as the Rang Mahal Mandira, where Krishna served the lotus feet of Radharani. 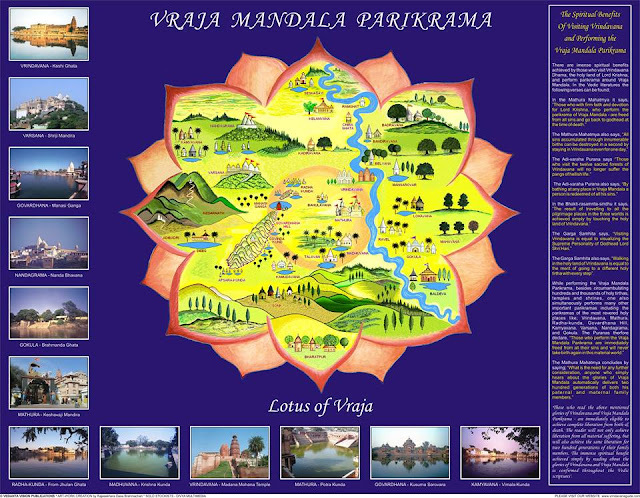 One can also see Lalita-kunda that was created by Krishna just to please Lalita-sakhi, and also the rasa-mandala platform commemorating the rasa-lila pastimes that took place here. Seva Kunja is also referred to as Rasa-sthali, because it was the site of Krishna’s most ecstatic rasa-lila pastimes with the beautiful gopis of Vraja. The rasa-lila or rasa-dance is considered to be the high-point of the nocturnal pastimes between Krishna and the gopis, during which every gopi has the opportunity to dance directly with Krishna. When the rasa-dance begins, Krishna stands alone in the middle as the gopis dance around Him in a circular motion, while singing songs in chorus and clapping their hands to the ecstatic beat of the drums. The most enchanting sound was created by the jingling of the gopis ankle-bells, as they dance in perfect unison around the rasa-mandala. Each gopi was thinking that Krishna was looking directly at her while she performed her dance of love before Him. Then by His mystical prakash potency, Krishna expand Himself into hundreds of identical forms to dance next to each individual gopi, who could then personally enjoy His loving embraces and taste His nectar-like kisses. 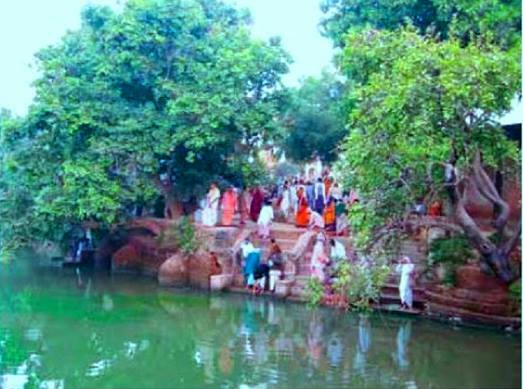 The place which is presently called Seva Kunja was formerly called Nikunjavana, and was one of twelve small forest groves of Vrindavana also called upavanas. Sometimes when the Puranas refer to Seva Kunja, it refers to all twelve of the sub-forests that form the inner-most core of the vast and expansive forest of Vrindavana. 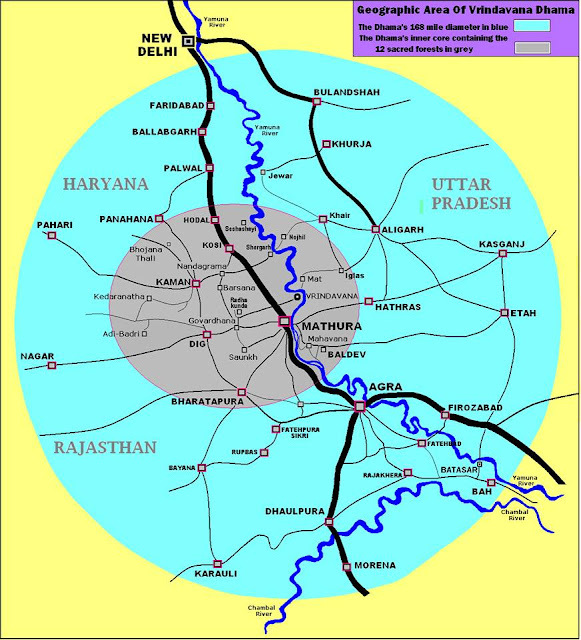 According to the Puranas, the whole area bordered by the River Yamuna, from Mohana Ter Ghata to Adi-Badri Ghata was referred to as being Seva kunja. Therefore, such places as Kaliya-Ghata, Madana-mohana, Imli Tala, Radha Damodara, Shringara Vata, Govinda Ghata, Chehana Ghata, Keshi Ghata, Nidhuvana, Jhulanavana, Gopinatha, Dira Samira, Vamsi Vata, Gopishwara, Brahma-kunda, Govinda-kunda and Govindaji Yoga-pitha, are also considered to be different lila-sthanas within Seva Kunja. 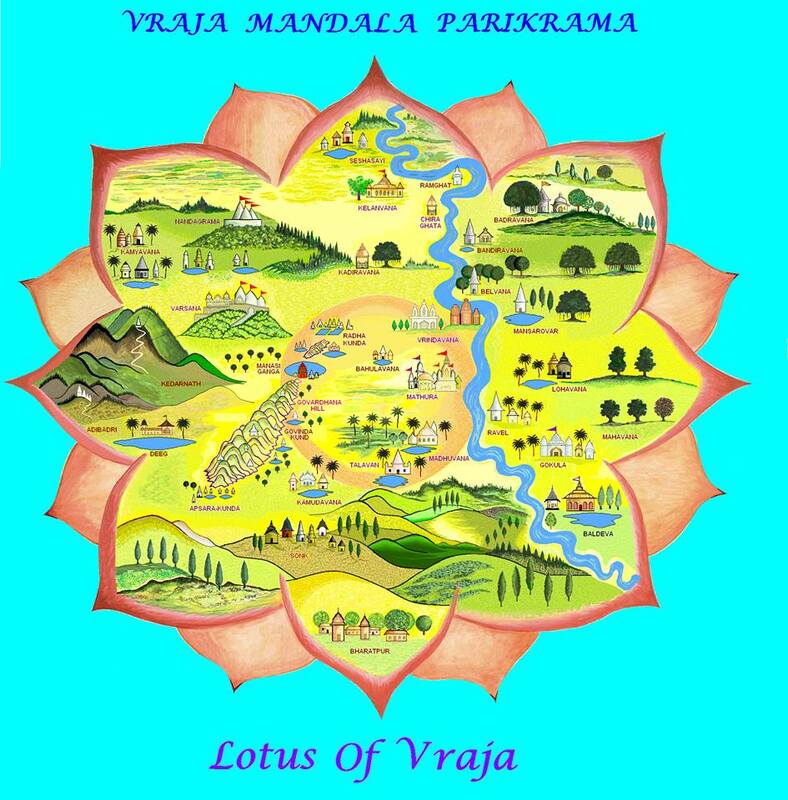 The Puranas also refer to these twelve small upavanas or sub-forests that surround the Govindaji Yoga-pith like petals of a lotus, as the ‘Garden of Vrindavana’. The Puranas say that the forest of Vrindavana encompassed a vast area stretching from Seva Kunja to Nandagrama and included Govardhana, Radha-kunda, Varsana, and the entire region on the western bank of the Yamuna as far north as Kelanvana. In the Brihad-gautamiya-tantra it says. 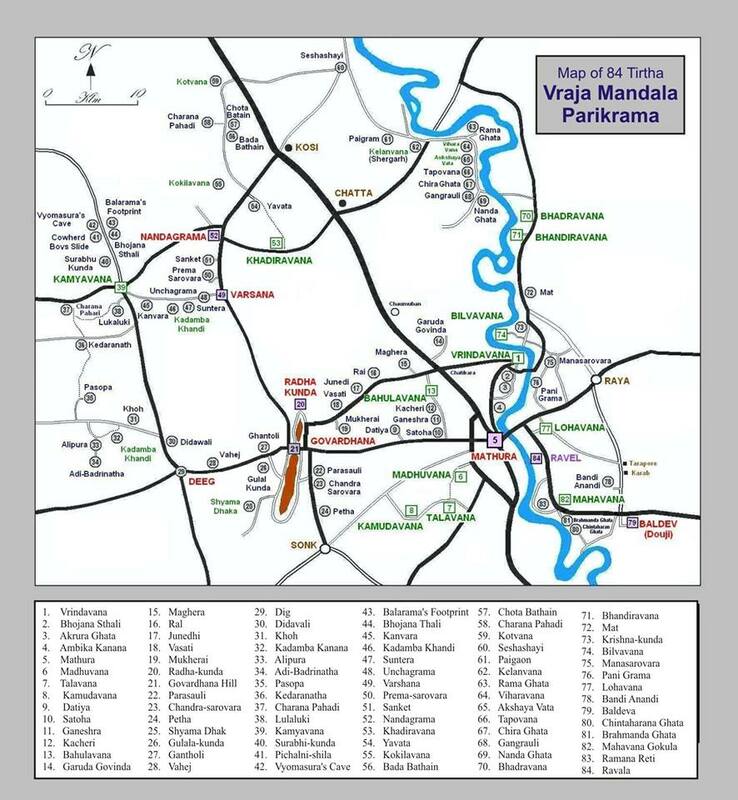 “The forest of Vrindavana consists of five yojanas.” Five yojanas is equal to forty miles which is the distance from Vrindavana to Nandagrama and the whole on the western bank of the Yamuna as far as Nandagrama is included in the forest of Vrindavana. Therefore when considering this vast area of Vrindavana forest, the twelve small forests or adhivanas are collectively known as Seva Kunja. 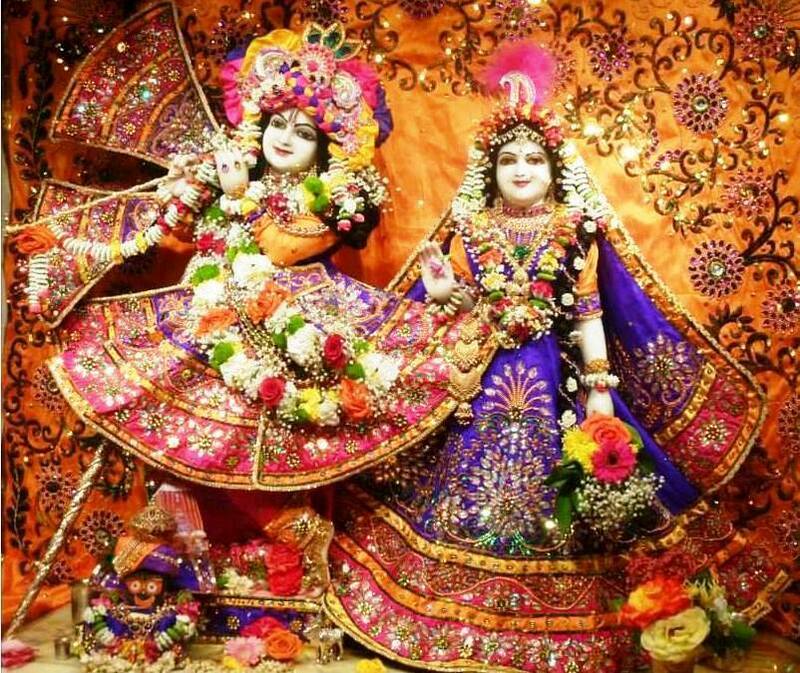 TRANSCENDENTAL PASTIMES OF LORD KRISHNA'S DEVOTEES IN THE HOLY DHAMA OF VRINDAVANA. The temple of Radha Shyamasundara is one of the ‘Seven Goswami Temples’ of Vrindavana and was established by Shyamananda Pandita Goswami during the course of his second visit to Vrindavana. Although he was not one of the Six Goswamis of Vrindavana, he is counted amongst the famous Gaudiya Goswamis who were important followers of Lord Chaitanya Mahaprabhu. The large deity of Lord Shyamasundara presently worshiped in the temple was installed by Baladeva Vidyabhushana during the period of his stay in Vrindavana during the late 17TH Century, when he reorganized the temple’s deity worship in accordance with the standards of archana-marga instituted by the Six Goswamis. The smaller deity of Lord Shyamasundara is said by some to be the deity given as a gift to Shyamananda Pandita by Shrimati Radharani Herself, although some historians say that this small deity of Shyamasundara was actually brought by Shyamananda Pandita from Southern India and worshiped by him in Vrindavana. Shyamananda Pandita, who was previously known as Duki, received diksha from one of Lord Chaitanya’s personal associates named Hriday Chaitanya, who hailed from the town of Ambika Kalna in West Bengal, and after his diksha he became known as Krishnadasa and remained at Ambika Kalna studying under his guru. 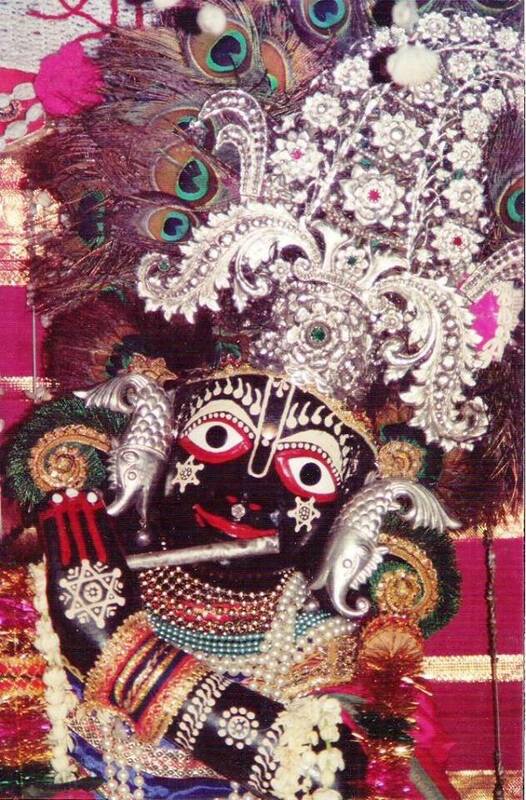 As there were many devotees called Krishnadasa, he was known as Duki Krishnadasa. Because Duki Krishnadasa (Shyamananda) showed signs that he could become a great Vaishnava scholar and preacher, his guru decided to send him to Vrindavana to study under the guidance of Shrila Jiva Goswami, and he therefore joined Jiva’s other celebrated students including Shrinivasa Acharya and Narottama Dasa, who accepted him as their younger brother. Even though he was a very learned pandita coming from a high caste family, he would take a broom and daily sweep the area around Seva Kunja, the place where Krishna once rendered personal service to Radharani and where the celebrated rasa-lila pastimes took place. Just opposite to the Radha Shyamasundara Mandira is the Tilak-sthana where Shyamananda found the ankle bell of Radharani and also the place where his pushpa-samadhi is situated. According to the Gaura-ganoddesha-dipika, Shyamananda Pandita was Kanaka-manjari in Krishna’s Vrindavana pastimes. There are many different of versions concerning the episode of Shyamananda, who was then known as Duki Krishnadasa, receiving the special tilak mark and a new name as well as a deity from Radharani, although none can be verified, the version which is accepted by the disciplic descendants of Shyamananda Pandita is as follows. One day while sweeping Seva Kunja, Duki Krishnadasa (Shyamananda) found a golden ankle-bell (nupur) lying on the ground. The anklet shone very brightly and after picking it up, he was overcome with ecstatic emotions and began to cry. He concluded that the anklet must belong to one of the gopis, or even Shrimati Radharani Herself. He carefully wrapped the anklet in his cloth and became consumed by thoughts of Krishna’s pastimes. After some time, a village girl approached him and asked if he had found a golden anklet that had been lost in Seva Kunja by her sister. Duki Krishnadasa informed the girl that he had indeed found the anklet lying on the ground and the girl asked him to give it to her and she would return it to her sister. Duki Krishnadasa told the girl that as he was the one who found the anklet, he would like to personally hand it over to her sister himself. The girl, who was actually Radha’s close friend Lalita-sakhi, disguised as a local village maiden, agreed, and guided Duki Krishnadasa to Lalita-kunda in the middle of Seva Kunja. She then informed him that if he wanted to meet her sister, he would first have to bathe in the sacred kunda. Duki Krishnadasa immediately bathed in the kunda and on coming out of the water, saw that his form had changed into that of a young girl. Duki Krishnadasa was then taken to a nearby grove where he suddenly saw the exquisitely beautiful and transcendental form of Shrimati Radharani, seated on a jewel-encrusted golden throne and surrounded by hundreds of Her intimate girlfriends. Radharani signaled for him to come forward and after offering his prostrated obeisance’s before Her, he handed Her the golden anklet. Taking the anklet from Duki Krishnadasa, Radharani thanked him for his wonderful service of daily sweeping Her beloved Seva Kunja. 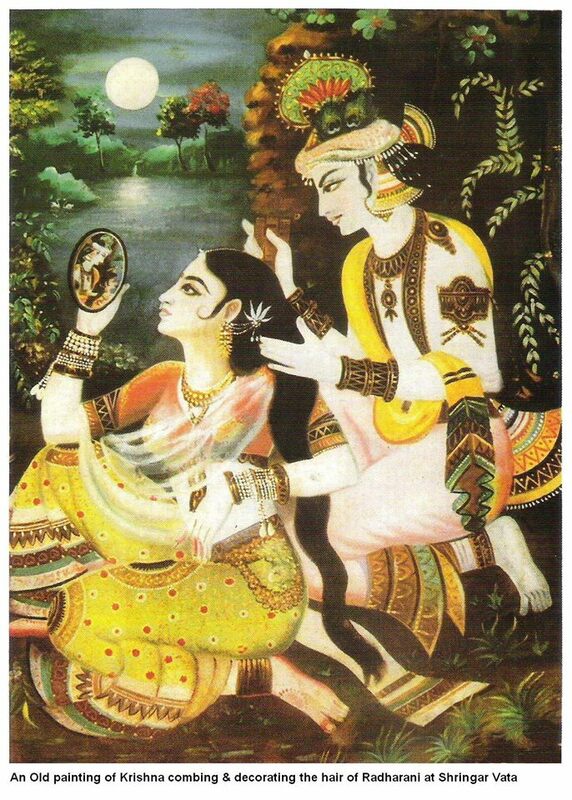 She then touched the anklet to his forehead, which left a special tilak mark on his forehead and give him the name Shyamananda, which means one who gives pleasure (ananda) to Shyama, another name of Radharani (pronounced Shyaama). She then gave the anklet to Duki Krishnadasa and asked him to personally place it around Her ankle. After he had done this, Radharani asked Lalita to present Shyamananda with the gift of a beautiful deity of Lord Shyamasundara for his personal seva-puja. Then after once again offering his prostrated obeisance’s to Shrimati Radharani, Lalita-sakhi escorted Duki Krishnadasa back to the place where she first met him, and by then he had regained his previous male form. Lalita-sakhi then requested Shyamananda not to reveal this incident to anyone. The next day, Duki Krishnadasa was seen by Jiva Goswami and the other students with a new tilak mark on his forehead, which appeared somewhat different to the regular Gaudiya tilak mark. That night in a dream, Lalita-sakhi appeared before Jiva and informed him of the circumstances surrounding the new tilak mark and the new name given to Duki Krishnadasa, but told him to say nothing. After some time the news of Duki’s name-change and new tilak mark reached the ears of Hriday Chaitanya in Bengal, who concluded that Jiva Goswami must have re-initiated his disciple. Hrdaya Chaitanya became disturbed as re-initiation amounted to a very serious Vaishnava aparadha. He was thinking that he had sent his disciple to study under Jiva Goswami, and now this re-initiation had occurred. Hridaya Chaitanya gathered his disciples and along with a group of senior Vaishnavas, immediately left for Vrindavana to challenge Jiva Goswami regarding the re-initiation of his disciple. On arrival in Vrindavana, a public meeting was arranged by Hridaya Chaitanya, where Jiva Goswami was going to be asked to explain the circumstances of Duki’s re-initiation. As both Jiva and Duki Krishnadasa were sworn to secrecy, the situation was very tense. That night before the meeting, Lalita-sakhi again appeared in Jiva’s dream and told him what to do. When the meeting started, Jiva addressed the gathering saying he had no part in what had transpired and had not re-initiated Duki Krishnadasa as some people thought, saying that the new name and tilak mark was a divine transcendental arrangement. To further prove the point, he requested Hridaya Chaitanya and his followers to wipe off the new tilak mark from Duki Krishnadasa’s body. If the new tilak mark could not be removed, then they would have to accept it was the divine will of the Lord. A few of the senior Vaishnavas from Hridaya Chaitanya’s group came forward, but when they tried to remove the tilak mark, it could not be removed, no matter how hard they tried. Hridaya Chaitanya then realized that it had been some transcendental arrangement. After embracing his disciple and apologizing to Jiva Goswami, he returned to Bengal with his party, fully satisfied that no Vaishnava aparadh had been committed. Even today, those in the disciplic line of Shyamananda Pandita still apply the same tilak mark. It became quite common for the disciples of various Gaudiya Goswamis to adopt some variation on the standard Gaudiya Vaishnava tilak mark, similar to the various tilak marks that differentiate the four Vaishnava sampradayas. The tilak mark used by Iskcon devotees is the tilak mark used by Lord Chaitanya and his disciplic succession headed by Shrila Rupa Goswami. Beautiful Hare Krishna song 1 Take care. Haribol.